The H1 NOVA (NW/CW) is a compact uni-body aluminum alloy LED headlamp with an output range of 1 to 500 lumens running off of a single CR123A or RCR123A battery. The focus and the flood are clearly divided, yet the area between the two is a smooth transition. The lightweight H1 is extremely small mimicking the size of an adult thumb. The light is connected to the head strap through a silicone mount, and can freely rotate to adjust the beam angle. After removing the light from the mount, attach the provided pocket clip and it can easily turn into a standard pocket flashlight with a magnetic tail cap. 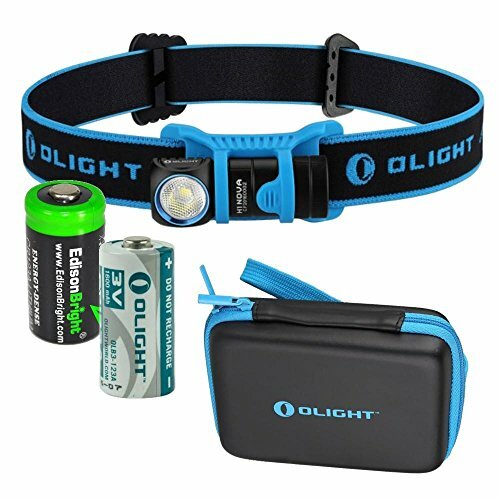 This high-output and convenient headlamp is an essential illumination tool for all activities in the dark. - Runtime based thermal management program: Under the turbo mode, the headlamp stays at the maximum output for three minutes before gradually dropping down to the high mode after one minute. - An additional EdisonBright CR123A lithium backup battery. Bundled with an additional EdisonBright CR123A lithium backup battery.